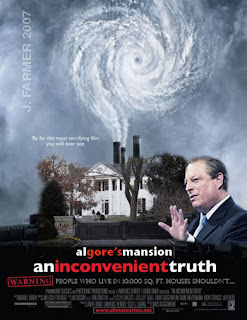 Yes, I know there are some lovers of Al Gore who regularly read this blog, but this one was entirely too good to pass up. The rumors have been flying all over the blogosphere for a few days now that Fred Thompson may be considering a run for President, but Howard Baker confirmed this morning that he is encouraging Thompson to run and making calls on his behalf. Howard Baker is an awfully big gun. I also discuss the coming Bloggers' Day On the Hill in Nashville. Johnia's family is doing everything they can to find the killer, and have found a few friends in high places who are rightly sympathetic to the cause, including State Senator Tim Burchett, State Representative Stacey Campfield, State Representative Jason Mumpower, and Lt. Governor Ron Ramsey. That all of these folks would concern themselves with bringing justice to the unknown man who committed this awful crime and to seeing to it that this doesn't happen to other women is the right thing to do. Sometimes, however, in trying to do the right thing, it is very possible to do something that seems good but could have extremely negative long-term effects. Specifically, long-term negative effects on people's basic constitutional rights. I believe that Jason Mumpower and Ron Ramsey are trying very hard to do the right thing in this case, but they have stumbled on to territory that is constitutionally tenuous at the very least and unconstitutional at worst. The problem with the bill is not the concept, but the dangerous wording. The bill requires that every person arrested for a felony after July 1st give a sample of their DNA to the authorities. The school of thought on this is that giving a DNA sample is no different than giving a fingerprint. I do not agree-you give your fingerprints for lots of good reasons. Mine are on file because I have worked with children as a religious instructor and the Catholic Church now requires that anyone in the Church who works with kids have their fingerprints taken and the authorities are to be made aware of who is working with children in an official capacity in the name of the Church-I have no problem with this and I happily complied. Taking DNA, a bodily acid, is quite another matter. Even taking a mouth swab involves a greater invasion into someone's personal space. Merely taking the DNA of an arrested person (as opposed to an indicted person, or any person convicted of any felony) makes a presumption of probable cause. When entering the legal and constitutional territory of probable cause, the Bill of Rights (both federal and Tennessee) is very clear: A warrant must be issued signed by a judge which describes the "place to be searched and the person or things to be siezed," in this case, the suspect and their DNA. We have a way to get DNA from felons and suspected criminals-obtain a warrant and get the DNA. Trust me, it isn't hard to do. Merely taking the DNA from an arrested person (as opposed to an indicted or convicted person) without a warrant essentially means that an individual's person is being searched without a search warrant-the search warrant is the legal document needed to constitutionally establish probable cause. Some may say "but David, what's wrong with an arrested person giving their DNA, what would they have to hide..." Our system of justice is built on the idea that all suspects are innocent until proven guilty. Just as the arrested suspect has the right to remain silent, they also can be neither arrested nor searched without the appropriate warrant. To pass legislation that essentially says the contrary is dangerous legal ground indeed, and could set the State up for court challenge after court challenge, a cost not figured into the bill's fiscal estimate. Legislators should also be reminded that there are jurisdictions in this State where perfectly innocent or otherwise harmless people have been arrested for the entertainment or appeasement of certain corrupt officials. This legislation would have allowed those officials to further humiliate said people without a warrant. Senators and Representatives should be reminded that they swore an oath to support and defend the Constitution of the State of Tennessee and of the United States. This legislation, though its purpose is noble, is quite constitutionally suspect-and it will not help find Johnia Berry's killer. Even if it were already in place, how does anyone know if the scum was ever arrested for a felony to begin with? Today's radio podcast deals with the Governor's greedy adherance to outmoded tax policy. I also pay tribute to retiring radio personality Gary Burbank (aka Earl Pitts). Governor Phil Bredesen's Finance Commissioner has come out swinging (or so he thinks) to tell Tennesseans that eliminating the tax on groceries will bring a shortfall to the budget of over 600 million dollars. At last count, our surplus-and this is before the Governor begins his proposed spending spree-stood at nearly that amount. If eliminating just the grocery tax (while leaving all other taxes in place) is going to put us $600 million in the hole, then the State of Tennessee is simply spending too much money and is apparently not living within its means.The Governor does not like the idea that he will not have money to burn, since he is in his second term, after all, and is no longer answerable to the people of Tennessee. I have no trouble believing that Finance Commissioner Dave Goetz' "study" is politically tainted to suit the Governor's agenda. Now that the Governor has his second term, he is free to tax Tennesseans to his hearts' content. I do not think for a second that any State Finance Commissioner of either Party is going to be hot on any reduction in taxes, and truth be told the Finance Commissioner would have a field day with an income tax. If the average Tennessee voter thinks for one piddling second that Bredesen is really anti-income tax, they are truly deceived. The Democrats' dream political scenario is to have an income tax enacted, and done so in such a way that the Republicans can be blamed. We could afford to give the people this break, and it would effect people who need the relief the most. Of couse, Bredesen is unwilling to consider a tax swap-the status quo is fine with him. 1. Ohio has an extremely high and very tyrannical income tax. 2. Ohio is the third-highest taxed State in the Union-the fact that they pay no tax on groceries is the ONLY relief they get, and it is minor...because everything else (and I mean everything) gets taxed. Yes, Tennessee can stand to eliminate the grocery tax-despite what the Governor says, we can afford it-but Tennessee should never be compared to a State with not only an income tax but such an ungodly tax rate. The dynamic is completely different. When Nicole and I lived in Cincinnati, want to know how we used our federal tax return? Did we buy a newer vehicle? Perhaps pay down some debts? Did we use it to buy a new wardrobe, or invest it in a bond or a CD? No, we used our federal tax return to pay our state and local taxes, because had we not done so, we would not have been able to afford to pay them. Cincinnati Enquirer columnist Peter Bronson used to have a saying-he said that the State should just put a sign on the Clay Wade Bailey Bridge that says "you are now leaving Ohio, will the last one out please turn out the lights." The State is rapidly becoming a social, economic, and political sewer because of high taxes and it only stands to worsen. If you ever wonder why Nicole begged me to return to Tennessee, and why I am anti-tax to the tune of the Boston Tea Party, there's a look into the window of my world-taxes kill people who are trying to make something of their life. They almost did that to us. The only taxes that ought to be paid are the taxes the government needs in order to function. If the government does not absolutely need it, the government ought not take it. Merely taking my money and doling it out to others (performing my charity for me) without my consent is wrong. There is a commandment that speaks against that sort of thing: "Thou shalt not steal." No, Tennessee ought not emulate Ohio, but we can afford to cut out the grocery tax and help some people who need it. If the Finance Director thinks we cannot, then the State is spending entirely too much money that does not belong to them. The money is the people's-let them decide how much they are willing to cough up to the State, and let the State live within those means. My friend and fellow East Tennessee blogger Terry Frank has uncovered the report in the Knoxville News-Sentinel that there is a bill about to sail through the Tennessee General Assembly that would move the Tennessee Primary from February 12th to February 5th-"Super Tuesday." Apparently, the impetus to make the move came from Democratic Party Chairman Gray Sasser and Republican Chairman Bob Davis, who are said to be concerned that Tennesseans will have "no influence" over the selection of the Presidential nominee if the Primary is not moved. I strongly oppose this frontloading of Primaries because it will make it virtually impossible for "darkhorse" candidates to have any opportunity to succeed. Had either Ronald Reagan or Bill Clinton had to deal with the nomination system as it apparently will exist in 2008, neither man would likely have been nominated. The 2008 system will likely result in the nomination of a candidate might not even have set foot in many of the States he or she will win in the days immediately preceeding that State's Primary. The present system also relegates our political conventions to the realm of nothingness. This is a dangerous turn indeed for Presidential elections in our country, and is something I feel so strongly about that I made it the subject of my radio podcast today. Chris Bundgaard and A.C. Kleinheider teamed up for a great interview with Mitt Romney at the Vanderbilt Marriott. With due credit to Kleinheider and Bundgaard, I am reposting that interview here with my thoughts. I agree with Kleinheider that Romney, while sounding very conservative, ducks the hard questions. He really ignored the question about how he might persuade someone who is conservative but opposed to the war to support him. That is, of course, an especially important question in light of Jimmy Duncan's endorsement of Romney. Duncan is not only the senior Republican in Tennessee's Congressional delegation, he is by far and away the leader among respected anti-war conservatives. So what did Romney say to Duncan to convince him? It might be in Romney's best interest to share that information, because in doing so he may convince other conservative bona fides like myself. Mitt Romney does not say, but gives a response of artful dodging. My wife tried to caution me last night to give Romney a bit of leeway "just maybe, just maybe his conversion to the pro-life cause is sincere," she said. After all, we are trying to win hearts and minds, and she said we do not do a very good job of it if we were to fail to accept the legitimacy of someone's change of heart if they really do mean it. She went on to admit, however, that she is not exceptionally thrilled by the notion of a Mormon running the country. Since we are Catholics, it bears noting that there were a whole lot of people who were not thrilled by the idea of a Catholic running the country in 1960. Religious bigotry came out at its worst in that election. There was even a group that issued what they called "Kennedy quarters," 25 cent-pieces where George Washington's head had been painted red to look like a Cardinal's regitta, the implication being that the Church was going to be running the country. In spite of Kennedy doing everything he could to distance himself from the Church and its teachings, Catholics turned out in droves for John F. Kennedy. Many believed that it was their chance to finally prove that they had arrived and were part of the American social and political landscape after years of being seen as not truly "American." Nuns and priests would tell Catholic school children to tell their parents to vote for Kennedy. Despite Kennedy's assertions to the contrary, many orthodox Catholics believed a Catholic President would transform the laws of the Church into the laws of the Land. I was once told by my late priest that the worst thing that ever happened to the Catholic Church in America was the Presidency of John F. Kennedy, because it taught Catholics (mistakenly) that you could openly defy Church teaching and still get Church backing-it ruined the Church's moral authority. A similar phenomenon is happening with Mitt Romney. Mormons are lining up in droves to support the decendant of an original apostle of their faith. I am not on the ground out West, but I would bet that there are many conservative Mormons backing Mitt Romney there who believe that the religious ideas of Mormonism will have an impact on government if Romney is elected. Romney, however, is setting himself up to become the Mormon version of JFK, and that is not a good thing at all if Mormons care about the moral authority of their church. Mr. Romney has the potential to be extremely dangerous on so many levels. Today's podcast deals with Congressman Jimmy Duncan's surprise endorsement of former Massachusetts Governor Mitt Romney for President. Is Duncan ignoring the Romney record? A lot of people may be wondering what I think of Congressman Jimmy Duncan's decision to endorse Mitt Romney for the Presidency. I must admit, it comes as a real surprise. I expected Duncan to say nice things about Romney, largely because he rarely has anything bad to say about anyone in public. An endorsement-well, I was stunned and as shocked as anyone. Duncan's political philosophy defines that of a true movement conservative. When he tells you he is anti-interventionist, he means business. As he voted against the Clinton adventure into the Balkans, he also voted against the Iraq War using the same reasoning. Jimmy Duncan doesn't just talk the pro-life talk, but he has voted that way when the opportunity has arisen. "Hypocrite" is a label that many on the Left try and apply to many conservatives, but have heretofore been unable to apply it to John Duncan, Jr. This is why I have great trouble understanding Duncan's endorsement of Mitt Romney. Romney may now be talking a good game to conservatives about what he claims to believe, but his record, his recent record, bespeaks a man who is not pro-life, a man who doesn't know when to stop spending the people's money, a man who does not cut taxes, and a man who can't decide where he is from. Is he from Massachusetts, where he has just finished a term as Governor? Is he from Michigan, where he was born, where his father served as Chairman of American Motors and later as Governor? Is he from Utah, where his anscestors settled and were members of the Utah legislature, where he ran the Salt Lake Olympic organizing committee, and where he once pondered running for Governor? I understand that life does change and people can and do move around. I have experienced the phenomenon in my own life. If you enjoy politics, it can certainly change your ideas and plans. At some point, however, you have to make a decision to put down roots and embrace a community and a people as your own-as something you yourself belong to and something that is at the very root of who you are. Mitt Romney is utterly rootless, and frankly he seems to have no sense of community or place. He does not strike me as the kind of man that someone like Jimmy Duncan would endorse. What is even more shocking is that Marsha Blackburn has chosen to endorse Romney as well. Blackburn has been seen for some time as conservatives' answer to Bill Frist for the 2010 Republican Gubernatorial nomination, and is often mentioned as the darling of Tennessee conservatives. Are these people that ignorant of the Romney record? I do not know, but what I do know is that either people are willfully ignorant, or they have voluntarily chosen to sell out. It is a sad state of affairs for the conservative movement. Today's radio show is a discussion of the 2008 Presidential campaign. There is a special emphasis on whether or not there is anything to the rumors of a candidacy by former Tennessee Senator Fred Thompson. The rumors are flying all over the blogosphere that Fred Dalton Thompson is considering a run for the Presidency. Some have said that Thompson is strongly considering the idea and that the prospects are promising that Thompson may run. There are other reputable sources who say it is not likely to happen. It has been pointed out by some that Fred Thompson is an establishment man, and would be a candidate of the Party establishment if he ran. Oh, Thompson would definately be someone the establishment could stomach, that is very true. He did, after all, run Howard Baker's re-election campaign in 1972. Thompson is not a liberal by any stretch, however. It was Thompson, after all, who was chosen by the White House to shepherd the nomination of Chief Justice John Roberts through the Senate, largely because Thompson could charm a snake into doing what he wants. Some have pointed to Thompson's previous endorsement of John McCain as evidence that he is not a conservative. I do not agree, largely because it ought to be remembered that McCain's 2000 campaign was more of an anti-Bush campaign than it was an establishment campaign. In spite of McCain's hollow support from Democrats, he ran in 2000 as a pro-life pro-gun anti-Bush conservative-McCain even made the statement in the run-up to the 2000 Michigan Primary that he was more pro-life than Bush (and openly courted pro-life Catholic voters in that State). McCain won the Michigan Primary. Thompson has stated that he believes Roe v. Wade ought to be overturned and the abortion question left to the States to decide, and this is a position that appeals both to pro-life voters as well as some on the other side as well. He also opposes gun control and has a reputation as a strict constructionist when it comes to Constitutional interpretation. In researching the matter on the internet, I discovered that a Thompson for President website does indeed exist (not this unofficial one), but note that if you click on it you need authorization to even enter the site. This leads me to believe that something is indeed up with the rumor that Thompson is considering a run for the Presidency. Consideration of doing something does not always lead to taking action on one's considerations, so I do not believe that there is any way that we can say Thompson will run. Similarly, I cannot say that I will endorse Fred Thompson unless or until I hear his personal platform as a candidate-and then I would make that decision. What can be said is that Fred Thompson running for President would suddenly change the complexion of the campaign. I believe a lot of folks who thought they were unrepresented in the GOP field would go great guns for Fred Thompson. For that reason he would immediately become a dark horse for the nomination. We did pretty well the last time an actor ran as a Republican candidate, as I recall. Today's radio podcast would normally have been up by now, but the server had not uploaded it in as timely a fashion as is usually the case. The normal Sunday sports show was somewhat pre-empted by a discussion of events earlier in the week in co-host Matt Daley's hometown of Enterprise, Alabama. Matt was also quite vocal in his opinion of the so-called "discovery" of the tomb of Jesus. We finally got around to a very serious discussion of college basketball. Matt may be joining me for a podcast on Tuesday as well, live from the Horizon League college basketball championship in Fairborn, Ohio. Many of our Protestant brothers and sisters often ask "why do Catholics do those things." Usually, I get those questions from people who wonder things like "why do you pray to saints" or "why do you have those beads." In light of my recent public comments regarding casino gambling and my known aversion to dry laws, I am getting the question "why are Catholics okay with that." Specifically, why is it that the Church does not view drinking and gambling as sins in and of themselves? Jesus did not view drinking as a sin, and we know this because he did plenty of it. Not only did he turn a massive amount of water into a massive amount of wine, but one of the many accusations the Pharisees made against Our Lord was that he was a winebibber (Luke 7:34)-and of course he drank wine as part of the Paschal Feast at the Last Supper. Note that while many people try and say it wasn't really wine he was drinking, or it didn't have alcohol in it, we know that the wine Our Lord drank did in fact have its natural alcohol content. We know this because the pasteurization process to prevent the natural fermentation of grapes was not invented until 1869 by prohibitionist Thomas Bramwell Welch. How does the Bible view drinking? The Apostle Paul warns Christians against overindulging in drink throughout his Epistles. Many Christians who favor the notion that drinking is a sin often quote Ephesians 5:18 "be ye not drunk with wine," but often leave out the next three words "wherein is excess (but be filled with the Spirit)." In listing past sins of converts, one that Peter lists is "excess of wine." (I Peter 4:3) The moral lesson to be learned is not "drinking is bad" but "drinking in excess is sinful." So is gluttony, yet the scriptures do not forbid us to eat. Paul even tells Timothy to drink wine to settle his stomach in I Timothy 5:23. Does this mean that all Christians should run out and drink to their hearts' content? No. Some people have a weakness where alcohol is concerned, and the scriptures admonish us to respect that. In Romans 14, Paul speaks of Christian liberty. He warns believers that what is fine for one Christian (and not sinful) may cause weakness in another, and we do not need to make our brothers stumble (Romans 14:21). Neither, however, is something made sinful or unclean merely because someone thinks it so. (Romans 14:13-14). The same can be said to be true with gambling. If you have a few dollars to spare, have you sinned by putting it on a football wager or going to the bingo game? Certainly not. If you are wagering your entire paycheck, you have certainly sinned. The sin was not in the thing itself, but in the abuse of the thing. Because self-control is a virtue in our faith, Catholics see no sin in drinking or gambling, but in the abuse of those things. This is why Catholics tend to be a bit more tolerant about whisky and wagering.